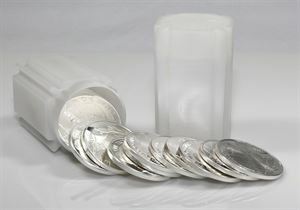 In addition to offering 10 ounce bars by A-Mark Precious Metals, we also have 10 ounce silver bars by the Morgan Mint. 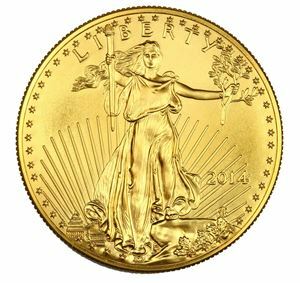 These bars are a bit fancier than the A-Mark ones and feature the profile of Anna Williams, known as the model for the legendary Morgan Silver Dollar. The artist of the design, George T. Morgan, regarded Williams as the most beautiful woman in America, and she is represented as Lady Liberty--a symbol of freedom and perseverance. On the reverse is an intricate crosshatching design that adds a uniqueness not always found in other silver bars. Store larger amounts of silver in a beautiful package commemorating a historical design with Morgan Mint's Silver Morgan 10 ounce silver bars--and save on premiums too. 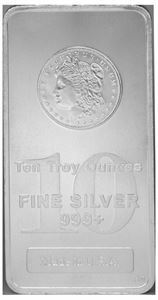 Call to specify which 10 ounce silver bar you would like today!